The YES! 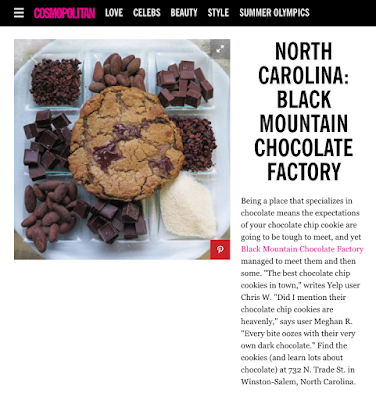 Weekly Blog: Black Mountain Chocolate makes the BEST Chocolate Chip Cookies in North Carolina! Black Mountain Chocolate makes the BEST Chocolate Chip Cookies in North Carolina! Our "Chocolate Chunk Cookies" are loaded with both our Dominican 70% Cacao Dark Chocolate and our Mountain Milk 53% Dark Milk Chocolate. They are sold only at the factory at 732 N Trade Street and at Cobblestone Farmers Market in Old Salem on Saturday mornings. To ensure freshness, we bake them in small batches, so customers wanting more than a few should contact the store to place a special order. Orders placed in the morning are usually ready by the afternoon. We are experimenting with shipping the cookies to see if we can add them to our online store. Black Mountain Chocolate started in Black Mountain, NC in 2008 and moved operations to Winston-Salem in 2014. We were the FIRST company in North Carolina and one of the first TEN chocolatiers to make bean-to-bar chocolate. The International Chocolate Salon and Taste TV awarded us "Four Stars, Superior Chocolatier" status in their 2016 ratings of Best Chocolatiers and Confectioners in America, Artisan Chocolate Awards. Our Mountain Milk Dark Milk Chocolate won a Good Food Award 2015. We are a visible factory so our guests can watch production through the windows or take a behind the scenes tour. So that you can see us in action, here is a link to a short video that aired on UNCTV's program, NC Weekend: https://www.youtube.com/watch?v=Ngzr5Ju63So"